Maranhão | Walk with us! Fr. 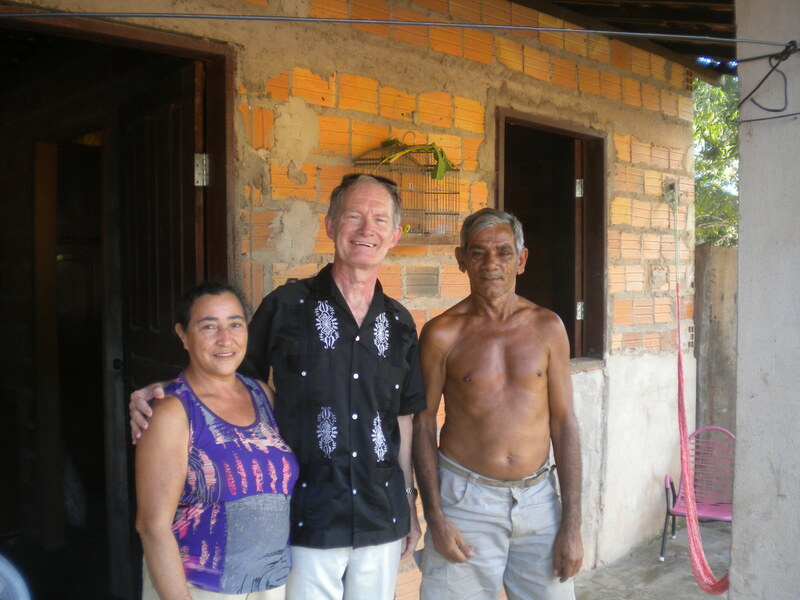 Tim visits a family in one of the rural communities of Maranhão, Brazil. On July 9 I arrived in Maranhão. The SCJs came to this neglected, underdeveloped state 43 years ago and demonstrated their commitment to it by making it an official region of the community (now, a district). As also happened in parts of the United States, the SCJs used their own resources to finance ministries which the local church could not afford. The night after I arrived I concelebrated Mass at Santa Paulina, the newest of the three parishes which SCJs have established on the periphery of São Luis, the capital. Mass was celebrated in the parish hall, while funds are raised for the new church. I was quite surprised at how bare and plain the hall looked, compared to the lavish decorations found in the simplest churches in Brazil; only one statue, a life size image of St. Paulina, presided over her flock. Threading our way past several classrooms and meeting areas to vest before Mass, we paused at the Eucharistic chapel. Perhaps as proof of our SCJ devotion to the Eucharist, this was the only room with air conditioning! We finally arrived at the tiny room that served as the sacristy, and now I understood why there were no other statues in the church. They were all here! They were huddled together on a table about the size of a card table, like a Noah’s ark, waiting for the day when they will be given their proper places in the new church building. Who knows, maybe they are being held hostage as well. After Mass, It happened that there was a big parish fundraiser in the street outside that evening, and so I discovered the rich folkloric tradition of Maranhão as two different dancing groups in exotic costumes put on quite a show. Who needs Carnival in Rio when you can see all this for free, take videos and then come out and join the dancers at the end? The next day I saw quite a different dimension of Maranhão. I hitched a ride with a priest and two seminarians to Santa Lucia. After a five hour ride, slowing for each of the dozens of speed bumps which mark the entrance to each village along the way, we arrived at 2:30 a.m. The sleepy town, the lonely church, the dogs sleeping among the weeds growing in the middle of the street told me I was in for a culture shock. Seeing things the next morning in the light of day did not do much to change my impression that this was a place forgotten by the outside world. I visited two of the six other parishes, which also struggle to stretch resources. One has a parish retreat center — it was the third one that I have seen so far! Amazing! In Mississippi we had to drive hours to find a diocesan retreat center, and three of our parishes here have one within walking distance. Of course, the dormitory here is a room with 40 hooks for hammocks… but there is an adequate kitchen, and rooms for talks, and a chapel. The commitment to formation of leaders is so evident. Guess what! Two of the parishes also have their own local radio stations! In places with so little entertainment, that is a great ministry. Of course, the hospitality of the SCJs has been outstanding — especially the enthusiasm of the younger members. Of the nine SCJs in these parishes, two are deacons and one a seminarian. Almost all of them are from thousands of kilometers away in the traditional heartland of Brazil, and have made the commitment to join this young District. It is truly missionary work.